VolapÃƒÂƒÃ‚Â¼k. An embarrassing medical condition, a Bulgarian seaside resort or a universal language invented by a German priest and in which the letter R is frowned upon? The VolapÃƒÂƒÃ‚Â¼k Language Movement flourished in the late nineteenth century, despite bitter rivalry with Esperanto and internecine feuding. 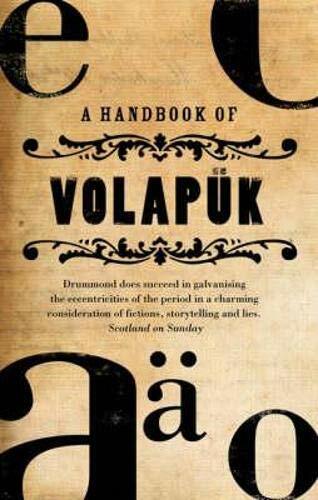 In this novel, Drummond constructs a fantastic world, full of chimeras, civil disobedience, hot-air ballooning, private lunatic asylums and church organs, and the occasional Arbroath Smokie. It s April 1891 and time for the Annual General Meeting of the Edinburgh Society for the Propagation of a Universal Language. The General Secretary, Mr Justice, a militant champion of VolapÃƒÂƒÃ‚Â¼k, is locked in battle with Dr Bosman, a shameless apologist for Esperanto. When the Annual General Meeting does not deliver the expected victory for Mr Justice, he decides to kidnap Dr Bosman and teach him a lesson a grammatical one in the conducive setting of the Mavisbank Asylum. Andrew Drummond was born in Edinburgh and educated at the University of Aberdeen, where he studied modern languages. He has published a number of translations from German, and his first novel, An Abridged History of the Construction of the Railway Line between Garve, Ullapool and Lochinver, was published by Polygon and shortlisted for a Saltire First Book of the Year Award in 2004. He lives in Edinburgh.